For any woman, finding the right outfit for a special event can be a challenge. But for US national fencing athlete, Ibtihaj Muhammad, it was particularly frustrating. The 29-year-old, who wears a hijab, in accordance with her Islamic faith, always struggled to find clothing that not only reflected her religious values of modesty, but also, outfits that weren’t frumpy. “When I looked at what was available to Muslim women, especially the younger generation in terms of modest fashion, I felt there was a void,” explains Muhammad to Quartz. Muhammad launched her modest clothing business, Louella, last year. The Los Angeles-based company offers an array of outfits that are fashionable but not revealing—stylish maxi dresses, flowing full-length skirts and chic long-sleeved tunic tops. Consumer response has been enthusiastic. Since opening, Louella has expanded its online catalogue from 10 to 50 items and is already profitable, according to Muhammad. Muhammad is part of an emerging cohort of millennial Muslim-American entrepreneurs catering to their community’s needs. Religious beliefs strongly shape the consumer habits of U.S. Muslims, who demand goods like modest clothing or products free from alcohol and pork. National retailers have yet to catch up and fill this gap, but in their place, young Muslim-American entrepreneurs are launching start-ups. Millennial entrepreneurship in America is on the rise, and over half of Muslims in America are between the ages of 18-39, skewing much younger than the general population. Many are first-generation Americans, more educated and tech-savvy than the older generation. Taking the entrepreneurial path to finding product options aligned with their religious values, therefore, comes naturally. Amin Aaser, a 27-year-old MBA student at University of California-Berkeley tells Quartz that his struggle with identity led him to start an Islamic book series for children. Growing up as a religious minority in Minnesota, he often felt conflicted between the necessities of his faith like fasting during Ramadan and wanting to fit in with his friends at school. When Aaser’s niece was born, he didn’t want her to face the same challenge. With his older brother Mohammed Aaser, 29, they brainstormed a solution to address this identity gap. The result was Noor Kids, a collection of kid’s books for 3- to 8-year-olds that uses playful “Dora the Explorer” type characters adapted for young Muslim-Americans. 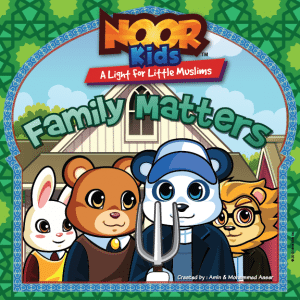 In Arabic, “noor” means light, and the series is designed to help Muslim children build confidence in their religious identities by seeing themselves in the book’s characters. So far, Noor Kids has sold over 25,000 books. Similarly, Washington, DC-area native Humaira Mubeen, 25, got the idea for her startup, Ishqr, after continuous complaints from single friends about the challenges of meeting eligible Muslims partners. In an online forum for young Muslims, she joked about setting up a website to help her friends find their soul mates. Ishqr, a play on the Arabic word “ishq” meaning love, primarily targets Muslim millennials. Originally, Mubeen started with a Tumblr blog where she manually matched people, but the response was so overwhelming that she launched a dedicated website last year. On the site, users can create profiles, upload photos and indicate whether they’re looking to date or get married. Over 7,000 people have already registered, and an app was launched last month. The Muslim-American market is an opportunity valued at $170 billion, according to a 2010 Ogilvy Noor report, a division of advertising firm Ogilvy & Mather. And that market is expected to grow. Yet, national retailers have largely ignored this demographic. One stumbling block for mainstream American businesses might be Islamic concepts like “halal” and “sharia”, the Muslim versions of kosher and religious law. “You have to understand that these words have a lot of negative connotations,” explains Faisal Masood, founder and president of the American Muslim Consumer Consortium (AMCC), to Quartz. Another complication is the Muslim-American community’s diversity. Muslims in America are largely an immigrant population; 63% were born abroad and hail from countries as geographically and culturally diverse as Somalia, Indonesia, and Iraq. Understanding the unique cultural aspects and religious sensitivities of the demographic are critical to successfully target this growing consumer segment. While companies like Louella started out by catering to Muslim-Americans, they are now finding success in the wider U.S. population. “We’ve moved past just providing clothing to the Muslim market,” reports Muhammad who has seen demand for her clothing among women of other faiths. Investors are taking note: Several have approached Muhammad about buying Louella, and last year, DreamIt Ventures, a Philadelphia-based accelerator program accepted Mubeen, providing guidance and funding for her dating site. International publishers in Indonesia and Malaysia have contacted Noor Kids’ to create translated copies of their books. Health is another opportunity with wider appeal. Dr. Mohamed Issa, 30, is CEO and co-founder of Noor Pharmaceuticals, a Long Island-based company that manufactures halal vitamins and supplements, and which has already raised a few million dollars in venture funding from institutional investors to expand its product line. Their all-natural NoorVitamins line does not use pig gelatin or alcohol, ingredients forbidden for Muslims but found in many commercial supplements.